The third and final (for now) portion of this series might be a tad anticlimactic. If so, we apologize. Most people know America is in debt beyond comprehension. A small subset of people understand that the numbers published by the government are missing a whole bunch of important items and use accounting methods that would land most business people in prison. An even smaller subset understands the idea of generational accounting. What we are going to discuss this time around is not the long-term situation, but rather the medium to short-term situation because some really bad things are going to take place within the next 5-7 years absent major, MAJOR policy changes. At that point, the policy changes will have to be drastic since our government fiddled while Rome burned for the last 3 decades. If you take nothing else away from this article, understand that our ‘leaders’ – of all political affiliations and stripes – KNEW this was going to be the result if they did nothing, yet that’s precisely what they did. The blame game this time around ought to be one for the ages, however a well-informed populace can short-circuit the traditional mudslinging by inserting the following statement: “You all knew. You knew and you did nothing. You are guilty of dereliction of duty. You failed your constituents and your country. ALL of you.” The few statesmen of the group of 535 will be echoing what we just said above. Former Congressmen and Senators who tried to warn their colleagues and the American people will be echoing the above sentiment. The guilty ones will play the blame game. The media will enable it and create an ‘emergency’, which will give the government cover to do something that the establishment that owns most of our leaders has wanted for some time now – the nationalization of the retirement system, means testing, higher taxes, a continued decline in the standard of living, and further debt accumulation. Every year after the government budget is passed, the Congressional Budget Office updates its projections for the fiscal situation of the US. As far as government reporting goes, the CBO doesn’t do too badly a job, but even it omits some pretty important information. We’ll preface the following analysis with the warning that the percentages and figures stated, while coming from the CBO’s report (which will be linked in this report), are missing what are called intergovernmental borrowings or intergovernmental holdings. An example is in order. Say Social Security has a shortfall (which it does) and borrows money from Medicare. The money is owed, but since we ‘borrowed it from ourselves’ instead of China or Russia or whoever, it is not counted as being publicly held debt. 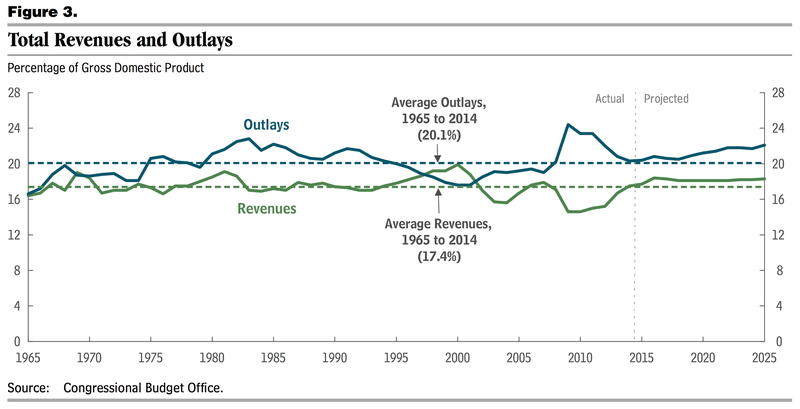 The CBO’s numbers and percentages are based on the debt that is held outside the government. Even the term ‘by the public’ is misleading since it implies that US citizens or institutions own this debt. While it is partially true, much of the debt is external in nature, although we have a feeling that is going to change as countries seek to divorce themselves from the USDollar. A second and equally important caveat of the CBO numbers is that they don’t apply all principles of GAAP (Generally Accepted Accounting Principles). When the government takes spending off balance sheet (which resulted in the few years of ‘surpluses’ you’ll see in the charts below, that violates GAAP. When it fails to compute and reveal the present value of future liabilities that violates GAAP. So why bother? The CBO reports, despite their shortcomings, have their uses, especially in terms of trend and sustainability analysis. We’re going to pick this report apart piece by piece, citing direct quotes and graphics, then offering commentary and analysis. We’ll go in order so you can download the actual report and follow along if you wish. First there are a couple of assumptions. We’re assuming around a 2.5% per annum growth rate in GDP. Given the last couple of quarters – the most recent of which showed a ‘growth’ rate of roughly half that CBO’s assumption when annualized, this is a stretch. The second – and the most important assumption – is that GDP will grow at all when debt levels continue their parabolic increase virtually unchecked. Don’t forget it isn’t just the government that is overstretched, but consumers too. Slack GDP growth is a rich environment for consumers borrowing more just to make ends meet, not to mention Americans’ need for all manner of toys befitting their self-imposed status as economic royalty. 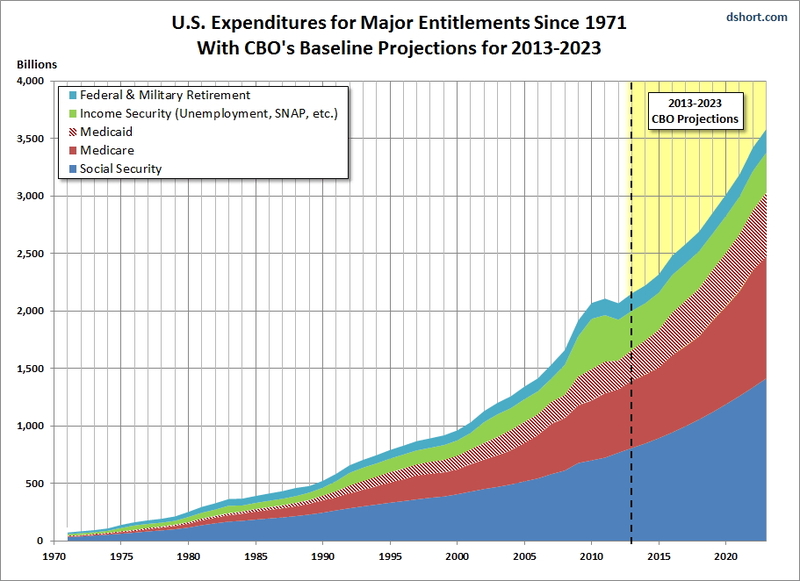 Then there is the matter of another $7.2 trillion added to what is almost $20 trillion now. And keep in mind, this is not GAAP accounting. The numbers are much, much higher. “Such high and rising debt would have serious negative consequences for the nation: When interest rates returned to more typical, higher levels, federal spending on interest payments would increase substantially. Moreover, because federal borrowing reduces national saving over time, the nation’s capital stock would ultimately be smaller and productivity and total wages would be lower than they would be if the debt was smaller. “CBO expects the government’s interest payments to rise sharply during the coming decade, largely as a result of two conditions. The first is the anticipated increase in interest rates as the economy strengthens. Between 2015 and 2025, CBO projects, the average interest rate on 3-month Treasury bills will rise from 0.1 percent to 3.4 percent and the average rate on 10-year Treasury notes will rise from 2.6 percent to 4.6 percent. Second, debt held by the public is projected to increase significantly under current law. Debt held by the public consists mostly of securities that the U.S. Treasury issues to raise cash to fund the federal government’s activities and to pay off its maturing liabilities. The net amount that the Treasury borrows by selling those securities (the amounts that are sold minus the amounts that have matured) is influenced primarily by the annual budget deficit. In addition, the Treasury borrows to provide financing for student loans and other credit programs; in the baseline, such additional borrowing, often referred to as other means of financing, is projected to average $61 billion per year during the 2016–2025 period (see Table 4 on page 11). So in essence what they’re saying here is that interest rates are going to rise sharply due to a strengthening economy. 10-year rates will almost double. Imagine what such movement – even if it happens over a period of years – will do to the debt appetite for the engine of the American economy – the US Consumer? We are not buying this for a second. The not-so-USFed has been so sloth to raise even the shortest term interbank overnight rates for fear of tanking the stock market and causing havoc with the yield curve. Notice how the government revenue function remains pretty flat after 2016. Where is this healthy economic expansion spoken of in the above paragraph? Surely a robust and growing economy would provide more government revenue even absent a change in the tax laws. We could go on, but there is no need to. The situation is unsustainable. It will likely go on for quite a bit longer than we imagine due to intricacies of the global dollar standard and the US Military, which we figure will become a big part of enforcing US economic hegemony even in the face of abject failure of the economic model being used. We’ve already seen that. If you buck the Petrodollar, you get labeled, marginalized, then bombed. Actually it is close to being that simple. The bottom line is it will end. Whether slowly as we believe (the unwinding has already started) or quickly as in a black swan type of event, it will end. The BRICs among others are already taking steps to hasten such an end. And yes, we believe such an end will likely not come without a major regional war. Or several, perhaps even a global war depending on how far the provocations go. We are basing our conclusions not so much on what the CBO has to say, but on our history and what has happened in the past when countries try to rip each other off and provoke while offering political subterfuge and general denials of any wrongdoing to the masses. I guess when it comes down to it, the saying that you can fool some of the people all of the time and all of the people some of the time, but not all of the people all of the time really does apply. Graham Mehl is a pseudonym. He currently works for a hedge fund and is responsible for economic forecasting and modeling. He has a graduate degree with honors from The Wharton School of the University of Pennsylvania among his educational achievements. Prior to his current position, he served as an economic research associate for a G7 central bank.